Backwoodsman's own stainless steel 15 oz. 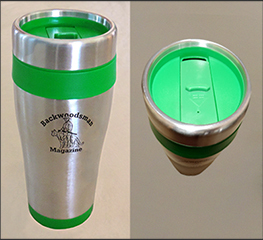 tumbler, with double-wall insulation that helps maintain hot or cold beverage temperature over a long period of time. Comes with a screw-on lid with a thumb-slide closure. 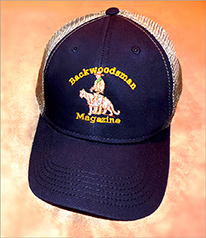 Backwoodsman green trim with a bold Backwoodsman logo. One of two new caps! A %100 cotton twill navy blue-colored cap with polyester gray mesh back Velcro closure, one size fits all. One of two new caps! A %100 cotton twill camoflauge colored cap with polyester tan mesh back Velcro closure, one size fits all. A teardrop-shaped side sling backpack, ergonomic ease and bold looks in a casual urban type pack. Crafted to be worn on one shoulder, with a black web adjustable strap. 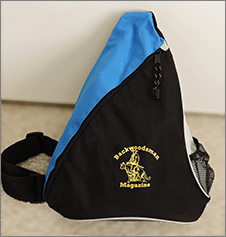 The main compartment secures with a large zipper, and there is a small outer mesh compartment for a water bottle. The size is 13"W X 17"H X 4"D. A super nice day pack for a few hiking items, fishing gear or around town essentials. Order our new sweatshirt for the cooler weather! Heavyweight 50% cotton/50% medium polyester that has been pre-shrunk. 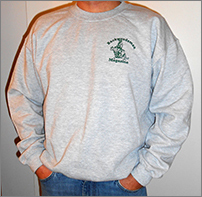 A nice gray medium heavy sweatshirt with the Backwoodsman logo in distinctive green lettering. A very nice sweatshirt for those days when a t-shirt just isn't enough! 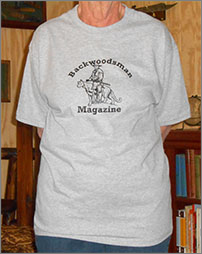 A brand new grey colored heavy t-shirt with the Backwoodsman logo across the front. Our new grey colored t-shirt, along with black lettering is one of the most handsome logo shirts that we've ever sold. A step up from the old shirt that we sold. This full size pack features an inset side water bottle pocket, a front zippered pocket and adjustable padded shoulder straps. The color is olive/black with "The Backwoodsman" in black lettering on the front of the pack. Our back-pack would make an excellent day pack for those roaming treks. 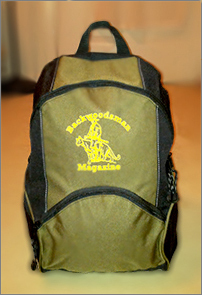 This duffel bag is 18"w x 10 1/2"h x 11"d, and features a large zippered main compartment with a permanent hard bottom. It also includes two zippered front pockets and a mesh water bottle pocket, padded handle and adjustable shoulder straps. Comes in forest green with yellow Backwoodsman lettering. 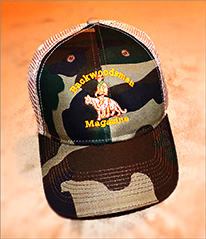 Say it loud, say it proud, I'm a BACKWOODSMAN!